If you love the sound of The Lumineers, Mumford and Sons, and perhaps even Old Crow Medicine Show - I plead you to check out this up and coming country band out of San Antonio, Texas! Band of Bandits add the perfect amount of folk and country poetry to their songs that prime them to become a new favorite! The song below 'Say Yes' has been perpetually on repeat on my iPod since discovering them during my trip to Austin! If you are a Refinery29 follower you might have picked up on the Ted Talk they highlighted where Cameron Rusell, a ten year model veteran, spoke honestly about modeling. It is a talk I believe anyone remotely interested in fashion, modeling, & photography should hear. She ended the speech with the quote below. This message can resonate with anyone and in any aspect of life. So many times perception, which is relative, defines how we feel about ourselves and our accomplishments. Yesterday was a deliciously relaxing day. Woke up early, exercised, baked more cookies (this might be a problem) and caught up on the day's Couture Spring 2013 shows in Paris. Instantly, I was drawn to Valli's darkness and femininity juxtaposition. So off I went into my sartorial dreams and came up with this lovely outfit inspired by look 10 in Giambattista Valli's Spring 2013 Haute Couture collection. I went a little far with purchases in December. (But the sales were too good to pass up!) So, I have been behaving and focusing on using my recent purchases. However, I always browse sales because you never know when that can enhance your wardrobe will be at an attainable price. Inspired by Fabsugar's New Year's Resolution #2 to embrace brights I have kept an eye out on a coat or jacket that could take my New England winter neutrals to new levels. Behold the items available at J Crew that can help you do just that! The coat is very Valentino a la Caroline Sieber style! Credit has to be given where credit is due. I just finished Looking for Alaska, an incredible book geared for the teen set, written by John Greene. As my blog illustrates I have an obsession with quotes, firmly believing we can learn so much from the wisdom of others. The main character, Miles "Pudge" Halter, has an obsession with Famous Last Words of great historical figures, the endless sprinklings of these quotes kept my curiosity peaked. Yet, it is the ending of this book with an introspective essay by which Miles attempts to answer how he will escape the labyrinth of suffering, which is life, that this book soundly defines the meaning of resolution & perseverance which is within the character of all individuals. We just need to tap into it! Yeah this isn't a quote, kind of a bit longer, but SO inspiring! 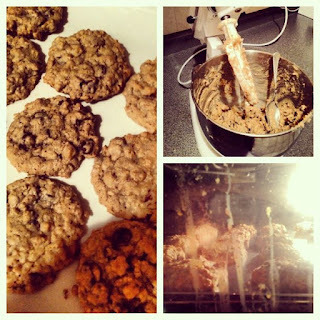 Neiman Marcus cookie baking from start to finish! As a kid I received a binder from my grandmother that had her favorite recipes typed up for us to try out. Since my American last name via my mother is Baker, I seriously believed as a child it was my duty to embrace and master baking. All through my teenage years I spent numerous hours in the kitchen baking these cookies here, as well as snowballs, coffee cake and banana cake - my top four faves! Of the many chocolate chip cookie recipes I tried over the years this remains my favorite. I love the mythical story which accompanies the recipe (more below), combining a fashion mecca aka Neiman Marcus, baking & the spirit of giving! Fast forward many years later I decided to re-embrace the baking hobby and gift myself with a Kitchen-Aid Mixer! So, on Tuesday January 1st, 2013 I baked these delicious oatmeal, chocolate chip & walnut cookies. Two days later there are none left, consider this a tried a true testament to how good they are!